Our posts are specially designed and fabricated for cable railing systems. All materials and shapes are available for 36in Residential Height and 42in Commercial Height, and may be Deck Mounted (to the top of a surface) or Fascia Mounted (to the side of a surface). The Aluminum Deck Post line was our first product line and remains our most popular due to its versatility and affordability. These posts are available in five powder coat colors and utilize a uniquely reinforced design in addition to boasting the innate economic value and light weight properties of aluminum. 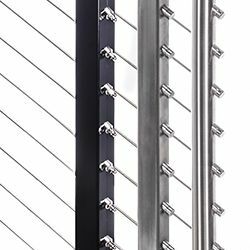 The Stainless Steel Deck Posts are available in two shapes: a pipe-like cylindrical design and a more classic square shape. These posts are made with the same Marine Grade 316 Stainless Steel as our cable and end fittings, assuring greater quality and longevity, even in marine environments. The Wood Post line offers square wood posts of naturally strong, resilient, and low-maintenance wood species that have been engineered into visually consistent and structurally superior beams, ideal for cable railing applications.